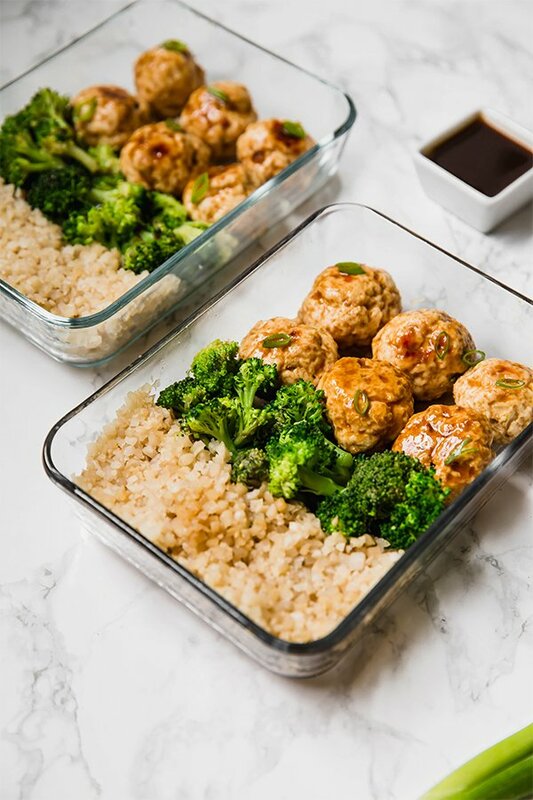 This teriyaki chicken meatball meal prep recipe is great for prepping on the weekend to have lunches or dinners for the week! It’s paleo, whole30, AIP and an all-around healthy lunch option. When I started transitioning to a paleo and eventually AIP diet a few years ago, I wouldn’t have lasted a single workweek without meal prep! I worked in an office that constantly had brownies or cookies in the breakroom, and my coworkers were always going out for a temptingly delicious lunch. If I weren’t prepping ahead, it would have been all too easy to throw in the towel and just wind up feeling sick later. Prepping meals ahead of time helped me get into a routine and see results with a healing diet faster. 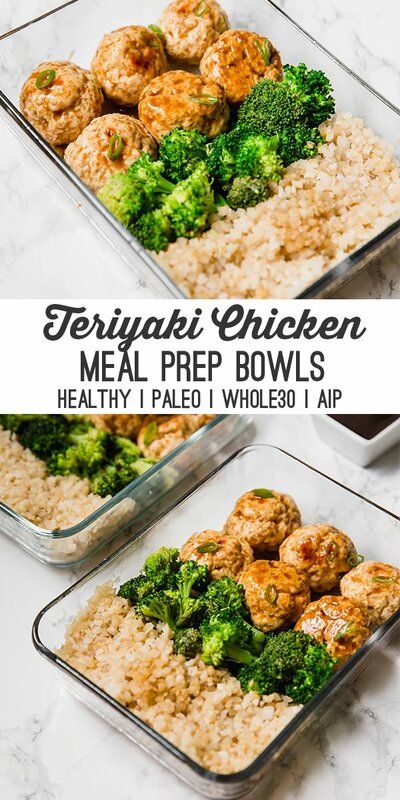 This teriyaki chicken meatball meal prep recipe is a great option to add to your meal prep list! There is a myriad of different methods you can use to prep meals for the week ahead. You can make several proteins and vegetables and mix and match for a variety of meals, or you can prep one big recipe and portion it out into smaller portions like this one. No matter how you prefer to do it, it’s an amazing way to stay prepared throughout the week. This recipe for teriyaki chicken meal prep bowls is super flavorful, easy to make, and is a crowd pleaser for different healthy diets! It’s easy to modify with different veggies and has a yummy sauce. Invest in good quality glass Tupperware. Plastics aren’t ideal. Consider using a heating device like a hot logic oven or a desk crockpot if needed. Keep it interesting! Meal prep is often referenced as being way too boring to stick to. Who wants to eat unseasoned, bland food every single day? It doesn’t have to be that way! Mix it up every week and opt for recipes with seasonal ingredients and flavorful sauces. If you can’t find ground chicken near you, simply use a food processor to grind your own with chicken breast or thigh! Cauliflower rice can be purchased pre-riced, or you can also use a food processor to rice cauliflower florets to make your own. If you’re able to tolerate rice and would prefer to have that, that works just as well! You can use another vegetable of your choice like broccolini, or bok choy. These are the ingredients for the teriyaki sauce. Feel free to swap the orange juice with pineapple, and leave out the honey if you’re on a whole30. My e-book Autoimmune Makeover also features meal prep instructions and recipes for 30 days! Combine all of the meatball ingredients in a large mixing bowl (reserving the green onion), and mix well. Roll the mixture into meatballs (you should have about 15-18) and place on the baking sheet. Bake in the oven for 20-25 minutes or until the internal temperature of the meatballs reaches 165 F.
Once cooked, remove the meatballs from the oven and allow to cool slightly. 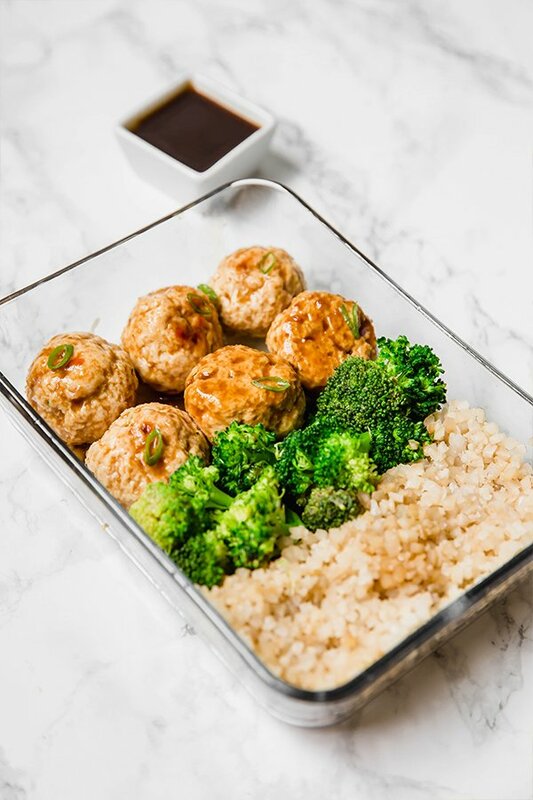 Toss the meatballs in the teriyaki sauce (see below) until evenly coated (reserving about 2 tbsp for the vegetables and serving on the side). Melt 1 tbsp coconut oil in a large, deep frying pan on medium heat. Saute the cauliflower rice with salt and coconut amino for 8-10 minutes or until cooked through and lightly crisped. Set aside. Using the same pan, bring about 1/4 inch of water to a simmer in the pan. Lightly salt the water and add the broccoli to the pan and cover with a lid to steam the broccoli for 8-10 minutes or until the broccoli is tender. Remove any excess water and set the broccoli aside. Combine all of the ingredients (reserving the arrowroot) in a small saucepan and set on the stove on medium heat. Whisk in the arrowroot simmer on low for 3-4 minutes until the sauce thickens. Set the sauce aside. 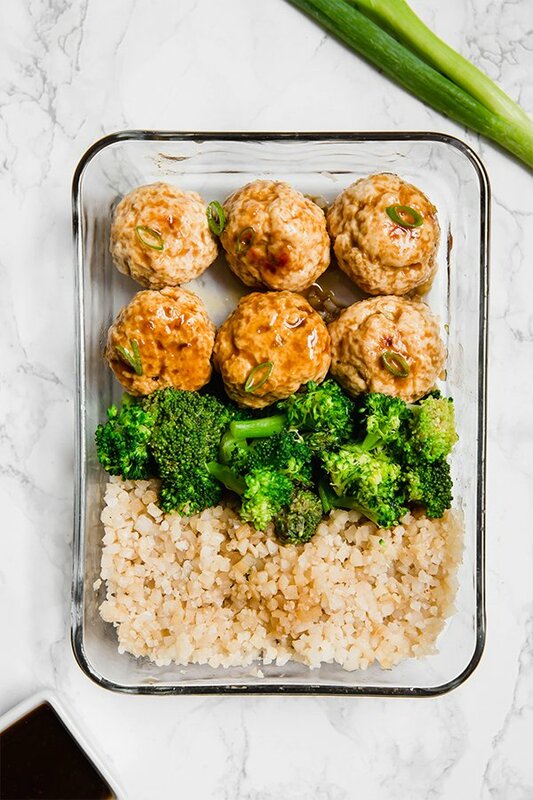 Use 3-4 glass containers to layer in the cauliflower rice, broccoli, and about 4-6 meatballs per container. Top the vegetables with the remainder of the sauce, or serve the sauce on the side, and add the chopped green onion on top of the meatballs. Store in the fridge for about 3 days and enjoy for lunch or dinner! Save time by making the vegetables and sauce while the meatballs are cooking. Is arrowroot flour the same as arrowroot starch? Can you use avocado oil instead of coconut oil? Love this recipe! It has become a staple in our dinner rotation. I used avocado oil and olive oil as a replacement for the coconut oil which I found too strong. I also used tapioca starch because that’s what I had on hand and it worked well. What would be a good substitute for the coconut aminos and oil? I am allergic. You can use avocado oil. There’s not a good swap for coconut aminos that’s AIP for this recipe. The coconut aminos is a soy sauce swap, so if you can tolerate other alternatives I would just use those.